You will feel that love when you open your box brimming with fresh delicious organic produce. Pass along the deliciousness to your family and friends with a Stir-fry special with Bok Choy or a Mushroom Pizza on Cauliflower Dough accompanied by a side of caramelized pears! We guarantee they will love you back. Our Beet the Holiday Bulge Deal is HERE and extended! Begin any new subscription and receive $10 off your first box. You will not be able to resist adding another box to your order! Quick, order by February 28th 2017 !! Check out below the New Host location Recipe of the Week below! Mouth watering but not yet a member? Sign up today! Help us spread the word about our new host sites! West Davie – We need 1 more Member!! Magnolia Birth House – We need 2 more members! Want a healthier workplace? Join our corporate wellness program! 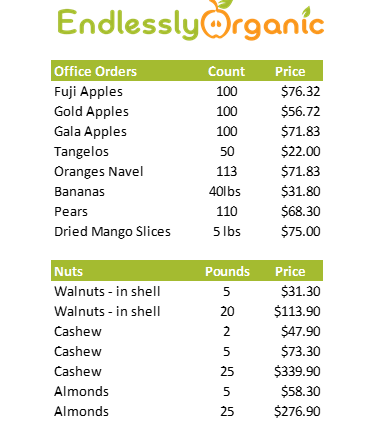 We can deliver our produce boxes directly to your office, in addition to providing wellness education! Contact us for more info! Miami Dade, Broward and Palm Beach Counties! Let us know if we don’t deliver to your area! Add-On/Sales to ADD to your order! This product is available ONLY to Endlessly Organic members. Share with us on Facebook or Instagram the delicious outcome!! Poke a few holes in the skin of the uncut spaghetti squash with a fork. Place entire uncut squash in the microwave and microwave for 8-10 minutes on high to get skin pliable enough to cut. Use a dish towel to remove the squash to your cutting board and cut from end to end in half. Place squash cut side down on a plate or platter and microwave on high for about 15 minutes, using five minute intervals. Once the squash is soft, invert and using a fork, pull and scrape the meat from the squash, finishing with a spoon to remove all flesh from shell. Discard the outer shell. Optional: Drizzle with olive oil before serving if desired.